1. If you are well versed in martial art, then use proper techniques to defend yourself and make your opponent crippled temporarily. But if you are not an expert in martial arts then the simple thing to do is to run away from someone who is very violent and may have arms with him/her. But if you are at gun point then you have no option than to beg for life and if the intention of the other person is to rob you then give everything whatever he/she wants. 2. 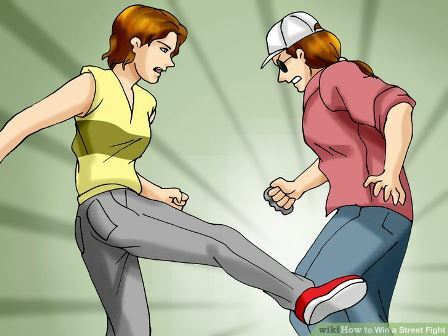 As a matter of fact, most of the street fights give less time to react and thus one must have presence of mind and should attack the opponent, if physical fight is unavoidable, at the soft spots. For example, hitting the nose causes unsustainable pain and can also blur the vision of the opponent. 3. Generally, once a fight starts on the street people gather and will be sympathetic to the person who has less probability of starting the fight. Hence you should attract or gather sympathy of the people around so that the opponent will feel threatened by the majority, who is on your side.